Wheatstone exhibited at the NAB 2019 Show in Las Vegas, where we picked up four major awards! Click to see highlights from the show. Audio mixing consoles/surfaces. IP routing and control. Audio processors. Digital editing tools. Wheatstone's products and studio systems are designed and built specifically for the demands of broadcasting. They cover a range from smaller single-station studios to large multi-studio, multi-station complexes with a million cross-points and dozens of mixers, talent stations, and elements connected across a region. Here are three videos where clients stepped into our booth at NAB to share with us what they've been up to. 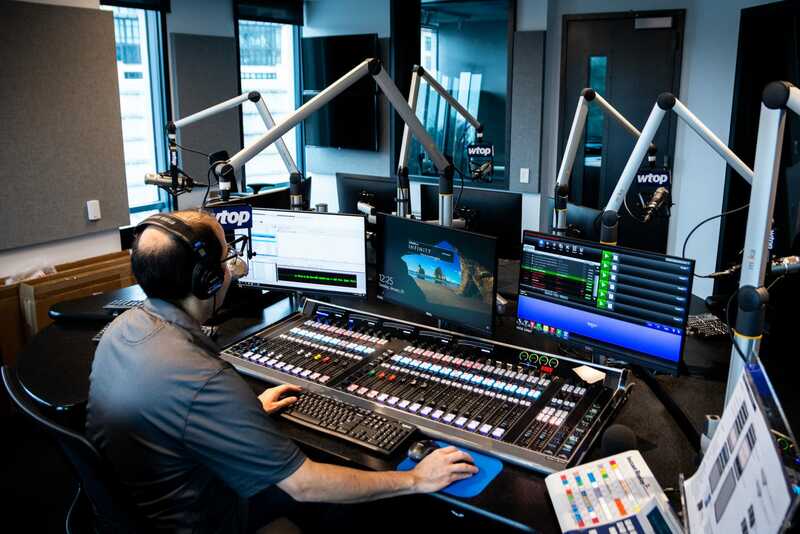 Radio DNA's Rob Goldberg talks with Scott Fybush about the WTOP project (see below) and other work he's been doing recently at NAB 2019. Jim Hibbard brings you up to date on some fascinating and original use of WheatNet-IP on The Dan Patrick show. Chief engineer Kevin Buente talks with Scott Fybush about how they are using virtual and cloud technology with their radio and TV stations. WTOP Washington, DC LIVE with Wheatstone! After more than a year of planning, WTOP, the nation’s top-billing station three years in a row, signed on from its new all-Wheat facility. Just before 10 pm on Saturday, Feb.2, WTOP anchor Sarah Jacobs gave the final temperature check from the old studios on 3400 Idaho Ave, signaling the cutover to WTOP’s new Star Trek-like space on Wisconsin Ave. Unique to the facility is a new Glass Enclosed Nerve Center that is laid out similar to a starship’s bridge, with a ring of 35 news workstations featuring virtual audio mixers designed by RadioDNA using ScreenBuilder development tools. Click here. We've got some cool ideas for you. Wheatstone is all about radio. Cool consoles and mixers. Intelligent audio IP studio networking and routing. PR&E Consoles. VoxPro recording and editing. AM and FM on-air processors that rock both loud AND clean. When you think of TV audio, you think of Wheatstone. Our consoles are the control centers for the finest facilities in the world. WheatNet-IP audio networking is becoming THE standard for interconnect. Only Wheatstone offers processors with the surgical precision of 31-band processing! Sound shaping for FM, AM, HD, television, webcasting, podcasting, mastering or live audio. For live, on-air recording and real-time editing, there's no better solution than VoxPro.